Deflated. Disappointed. Let down. Unsurprised. All of those emotions ran through my being at one point or another following Apple CEO Tim Cook's comments regarding "converged" devices, but if anything, his denial has made me all the more hungry for this particular device. For months -- heck, maybe even years -- I've waited for Sir Jonathan Paul Ive and co. to finally nail the concept of a laptop / tablet hybrid. In many ways, Apple managed to get right on a smartphone in 2007 what I felt was wrong holding a BlackBerry. I still think the iPad's screen is about 2.7-inches too large for my own personal tastes, but the world at large has affirmed that it nailed that design, too. Oh, and the MacBook Air? C'mon -- we all know it's the thin-and-light you always wanted, and given that it'll run Windows with poise, it's arguably the sexiest Windows laptop currently on the market. The point? Apple has waited for companies to flounder about with certain designs before, all while perfecting its own take for a future release. Windows-based tablets were flooding out in the early noughties, and believe it or not, Toshiba was already giving the tablet / laptop hybrid thing a whirl in 2003 with the Portege 3500. Apple waited over half a decade to usher in the iPad, and the rest -- as they say -- is history. The iPhone followed a similar path; companies came before it and did their best to produced pleasing, long-lasting, highly usable smartphones, but the iPhone completely changed the trajectory of everything that came after. Love it or hate it, it's hard to imagine a 2012 with Windows Phone in it had Apple not pinned Windows Mobile in a corner back in '07. So, if Apple has shown an ability to thrive with designs that others have experimented with, why is the "converged" laptop / tablet a nonstarter? During the conference call following Apple's blowout Q2 2012 earnings -- a quarter where it raked in $11.6 billion in pure profit on the wave of monumental iPad and iPhone sales -- Tim Cook was asked about the potential for converged devices. More specifically, if Apple had a plan for countering the impending glut of Windows 8-based tablet / laptop devices. His response? "You can converge a toaster and a refrigerator, but those aren't going to be pleasing to the user." "We are not going to that party, but others might from a defensive point of view. Anything can be forced to converge, but it's all about trade-offs. Some of these trade-offs leave you with something that doesn't please anyone. Our view is that the tablet market is huge -- we've said that since day one -- we were using them here and it was already clear to us that there was so much you could do, and the reasons for use is so broad. iPads have taken off in consumer markets, in education and in enterprise -- it's everywhere you look now. The applications are so easy to make meaningful for someone, and as the ecosystem gets better and better -- and as we continue to double down on making great products -- I think the limit here is nowhere in sight." I've stated once or twice before on the Engadget Podcast that my dream machine would be an ultra-sleek Windows 8 tablet with 10+ hours of battery life, blistering performance and a no-nonsense method for docking and becoming a full-scale Windows PC. If you need visuals, wrap your gord around a Transformer Prime with Windows 8. The idea here is simple: on the go, I've got a Metro-fied device that's conducive to touch (unlike the Windows 7 that exists today), but when I get settled, I can use the exact same device to access a full file system, and -- quite frankly -- do things that hamstrung tablet operating systems cannot. Is it a shoehorned approach? Of course -- a single OS is servicing two methods of use -- but why should that challenge be viewed as impossible? Or, uninteresting? Is Apple really going to let Metro rule the converged space without so much as a fight? Apple rightfully suggests that the iPad is fantastic for a lot of things. Goofing off with photos in iPhoto, creating trailers for at-home use, sending the most basic forms of email, checking up on the weather, doling out beautiful presentations and scouring the web for a nonexistent sale on a pair of Jack Rogers sandals. But it's not a MacBook, and clearly, Apple knows it. Attachments through email on the iPad are painful to execute (if not impossible in some instances), and the lack of support for a wide array of USB peripherals via the Dock Connector is a bummer for power users. To me, this screams opportunity. To Apple, it screams "run." I fully recognize that ignoring this segment (or "potential segment," for the pessimistic) is the easy thing to do. 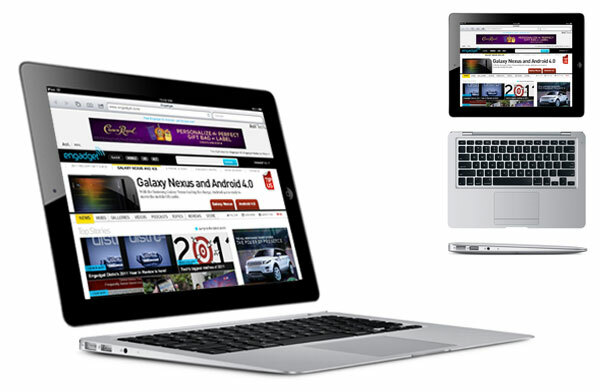 There's essentially no risk involved in continuing to produce great iPad products and great MacBook products. They'll continue to do well so long as Apple continues down the road it's on. But I'll be honest -- there's no consumer electronics company on the planet right now I'd trust to nail a converged device like Apple. Just look at what the company already has to work with. And here's where it really gets crazy: Apple is an undeniable fan of convergence. It's managed to build an iPad with more pixels than your HDTV and a battery-sucking LTE chip, and it still lasts around 10 hours while pulsing full-steam ahead. It's managed to build some of the world's thinnest and lightest laptops, also with world-class battery life, at price points well below even the original Adamo. It's built an insanely respected ecosystem that -- in many ways -- links OS X and iOS together. To say that there's no foundation in place would be foolish, and this is just speaking to the products the public knows about. Just imagine what's lurking in the test labs in Cupertino, and you can more easily see why I'm frustrated in Apple's choice to not even give this segment a passing glance. And here's where it really gets crazy: Apple is an undeniable fan of convergence. The photo above was taken by Ryan Block at Macworld 2007. 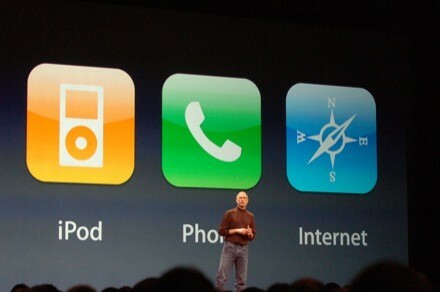 Technology fans may recall that environment as the keynote where the original iPhone was introduced. Steve told the audience that three new products were to be announced in mere moments. He then proceeded to inform the crowd that a widescreen iPod with touch controls was the first device; following that, a "revolutionary new mobile phone." Finally, "a breakthrough internet communications device." He then affirmed that these "were not separate products," and indeed, iPod sales have been sinking in recent years as the converged iPhone became a suitable replacement for a dedicated MP3 player. Apple willingly cannibalized its own iPod market with a converged device. Something tells me Mr. Cook would view those two more like "a microwave and an oven." It doesn't stop there. OS X 10.7 (Lion) was the first major edition of Apple's desktop OS that exhibited undeniable influence from iOS. With the introduction of the Magic Trackpad, Apple's highly customizable 'gestures' menu in Settings and Launchpad / Mission Control, even the most casual OS X user could feel the iOS creep. It was obvious. "Until now, Mission Control has roughly approximated the iPhone's grid layout in a desktop setting -- but that feature always felt like a bit of an aside, something the user could safely ignore if he or she saw fit. This time out, the mobile influence is far more robust, baked in to the point that it will almost certainly force upgraders to adjust their workflow." And lest we forget the addition of Messages (a product that arrived in iOS first), Reminders (again, an iOS mainstay), Notes (just guess -- go ahead), Notification Center (I'm boring you, aren't I?) and Game Center. The iOS-ification of OS X is not only a talking point, it's an incontestable reality. So, if Apple is already working to converge pieces of iOS and OS X, how is this not setting up a new device that bridges the gap between the functionally-limited iPad and the not-quite-as-portable MacBook? The obvious issue, of course, is that Apple doesn't currently have an operating system that can beautifully work on both tablets and desktops / laptops. Windows 8 was engineered from the ground-up to work well on both tablets and full-scale machines; it may have its pitfalls, sure, but it manages to pull off the hybrid thing better than any other operating system ever created, from what we've tested thus far. For Apple to craft a laptop / tablet conglomerate, it'd either need to allow a dual-boot scenario (iOS + OS X), or release a build of OS X that would strip out the more complex features and rely only (or predominantly) on the iOS-borrowed feature set when used as a slate. Or, it could outthink me completely and develop an even sexier usage scenario. Whatever the outcome, I'd be overly curious about the final result, and would almost certainly be a prospective buyer. 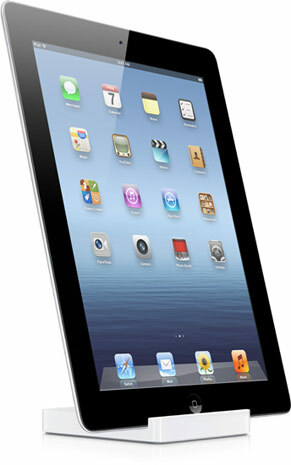 And if Apple could somehow create it in a way that fit into the iPad form factor, all the better. That would obviously allow tablet-only buyers to proceed as normal, while more ambitious customers could opt for a theoretical keyboard / trackpad docking accessory to unlock the desktop-like potential within. I'm genuinely hoping that Cook's stance stands a chance at changing as time rolls along, as tablet chips get more powerful and as iOS and OS X continue to lean into one another. But I'll be honest -- I really wish he was more gung-ho about the whole concept in the here and now, and I'm pretty sure I could find at least a handful of folks that'd open up their wallet to agree with me. This article originally appeared in Distro Issue 39; toaster / fridge photo courtesy of Greg Grabowy.